Discussion in 'Comics Central' started by Jason73, Feb 5, 2017. I'm watching it, just caught to the third episode! I don't enjoy teen dramas all that much, and yet I've watched both this and 13 REASONS WHY, but only through binging on them. They don't appeal to me on a weekly basis, but once I have all the episodes available, I can sit and enjoy them over a few days or in one week. Are you all waiting to binge-watch the show when S3 has finished? So far season 3 is shaping up to becoming much better than season 2, last nights 90s episode was brilliant. Though I’m not certain, but even though this seemed to be the early 90s there seemed to be a lot of 80s songs being played, however if this episode was set circa 1990-94 then those years were an 80s extension. I stopped watching in March after that "weekend getaway" with Archie, Veronica, Jughead and Betty. Can't bring myself to watch it again. 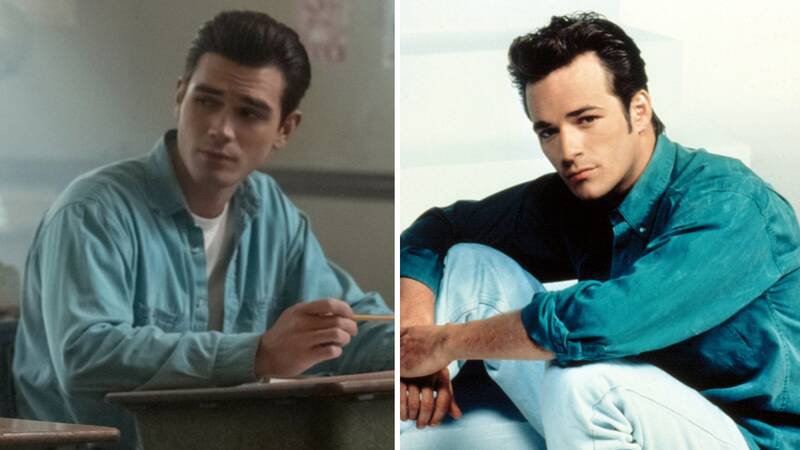 I thought KJ did a good job channeling 90's era Luke Perry in this week's episode. How come?? Season 3 so far is much better than season 2. Not sure how to feel about this? Seems like bi erasure strikes again :-/ would be nice to see a broader spectrum of sexuality there is more than just straight/gay binary after all. Is anyone still watching RIVERDALE? Veronica is now seemingly with Reggie, so I hope Betty/Archie happens in season4! I'm still watching but I'm about three or four weeks behind. I'll have a binge soon. I've sort of felt like they were building towards pairing Reggie and Veronica (who are dating in realy life) the entire season, so I'm not surprised if they are together now. Veronica/Reggie have way more chemistry too, of course this is down to them dating in real life, but I think Varchie has faltered now, I heard a rumour that Bughead may split too this season, I wonder if this has anything to do with Evelyn from the cult? I hope they do split since couples on long running shows need to be mixed up. Archie/Josie is set to happen but apparently not for long. Honestly I think the writers are deliberately putting off Betty/Archie simply because they don’t want to upset Bughead fans.